While it’s no relation, with a name like ‘SOS’ we couldn’t miss this one, could we? And despite its apparently simplicity, it can actually make a big difference when used in a typical pedalboard setup. Where you have a lot of passive bypass pedals coupled with long cables, treble loss and compromised ‘feel’ can become a real problem, which is why many pedal companies now build dedicated buffers to put at the start of your pedal chain. Essentially a buffer has a suitably high input impedance to keep passive guitar pickups happy but has a relatively low output impedance, allowing it to drive capacitive loads (such as long cables) with much less HF loss. 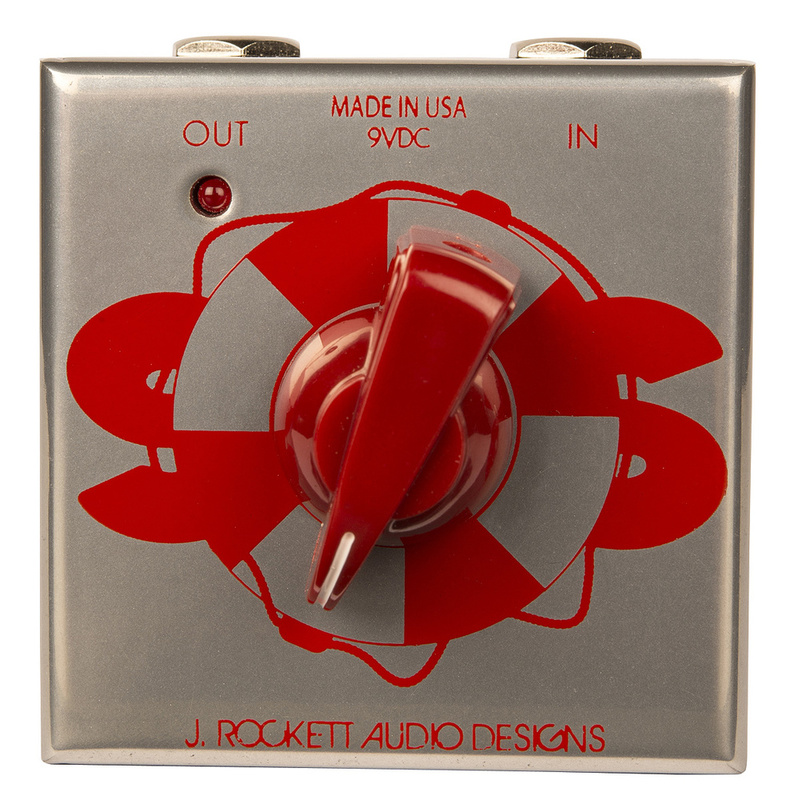 The Rockett SOS is slightly different from most of the competition, in that it has a single control that varies the high end in a very restrained way, to help match your tone to compensate for any HF loss caused by having a long cable connecting to the guitar. This red ‘chicken-head’ knob sits inside the ‘O’ of the SOS logo and the sound is brightest with this in its fully clockwise position, though the tonal range is nicely subtle. It’s claimed that the buffer ‘plays nicely’ with those wah and fuzz pedals that normally work best fed directly from an unbuffered guitar. Measuring a little under 2.5 inches square, the pedal is extremely rugged, built into a stainless-steel case with metal jacks. It can operate from a 9V battery if required, accessed by removing the base plate (held into position by two cross-head screws), though as most buffer applications will be as part of a pedalboard setup, it is more likely that the centre-negative Boss-compatible power connector will be employed to hook up to external power. A red LED indicates when the pedal is powered up. There’s no bypass option — quite rightly too, as that would not be applicable to a buffer, which should always be on. In use, the SOS Buffer works extremely well, and the ability to claw back any missing highs is very welcome. (I did hear a bit of background grumble when using an unregulated supply, so a decent pedalboard supply is recommended.) Overall, the guitar sound just seems ‘better’ when this buffer is placed at the front of the chain. In the studio, the buffer can be used in front of an audio interface that doesn’t have a dedicated instrument input setting to match the guitar to a line input. But even where an instrument input is provided, you might just prefer the sound with the Rockett SOS in the signal path. It may be simple but it really works, and it doesn’t cost that much either.